I grew up in the country on the Moe farm east of town so going to “town” (as we referred to it) was always a special treat. I look back on these times with fond memories. I’d like to think it wasn’t long ago that I was in downtown Ellensburg with my family visiting the stores of my childhood or attending a special event. Taking a trip down memory lane… there was Berry’s, a favorite for anyone in the family since it had something for everyone. We always knew when we were getting a gift from Berry’s because the employees wrapped those gifts in impeccable form without fail, every time. Getting lost in the clothes racks at JCPenney’s was always a fun game while shopping for school clothes, followed by a stop at Mundy’s for that perfect pair of back-to-school shoes. I clearly remember when my parents purchased a couch and loveseat from Fitterer’s Furniture. It was a momentous occasion! For me, each store’s distinct smell, layout, displays, owners, and employees all bring back fond memories of my childhood. I still long for a bagel with sun-dried tomato spread from Billy-Macs or being mesmerized by the detail in the murals illustrating the walls at Sweet Memories while sharing a cinnamon roll with one of my sisters. And the Valley Café – THE destination for dinner before a formal high school dance. Downtown Ellensburg is where we would go to see a movie, either at the Liberty or Grand Central. I remember renting rollerblades from Mountain High Sports and joining friends as we bladed downtown after school. And then there were the annual events we attended or participated in as a family. It was a tradition. Rain, shine, hot, cold, snow or wind, we would go. The two I remember most were Moments to Remember and the Ellensburg Rodeo Parade. Some memories are distant, slightly faded, a mere glimpse. Some are as vivid as if they happened yesterday. But each adds to the gratitude I have for growing up here and the pride I take in our town. Downtown Ellensburg has changed a lot since my childhood. Many of the family-owned stores have been replaced with new ones that I enjoy frequenting with my own little family. Special trips include a visit to Nerdcore or Central City Comics for my son (and husband); posting up shop at D&M downtown for a Claussen and chocolate milk for me and maybe a treat. And let’s not forget ABC Donuts – a family favorite. Admittedly, I have to change my route some days to avoid the donuts or it will be a never-ending request from my daughter. Chartreuse Gifts was a hot spot for me this holiday season as I hit the motherload in unicorn everything. The Dollar Store is a kid favorite as they can score big with their $5 from Nana and Papa. Downtown businesses are always friendly to my kids, welcoming them in. Making a stop and gazing in at all the reptiles, fish, rodents and birds at Ellensburg Pet Center is a special treat the kids always look forward to. If we’re lucky a kitten or puppy will eagerly greet us. I like to think my kids will look back at their time in Ellensburg and remember the shops and stores, just as I do. Together, we stroll through the Farmers Market on the weekends enjoying the face painting, balloon characters, a special tropical drink or cookie, and fresh produce. Creating these special memories for my children is high on my list, and we often attend events downtown – Buskers in the Burg, Cookie Scavenger Hunt, Moments to Remember, Dachshunds on Parade, Ellensburg Rodeo Parade – the list could go on. And let’s not forget the events reserved especially for the adults, which my husband and I love to take part in as well. To me, a vibrant downtown is one which encourages, supports, and provides memory-making opportunities for me and my family. 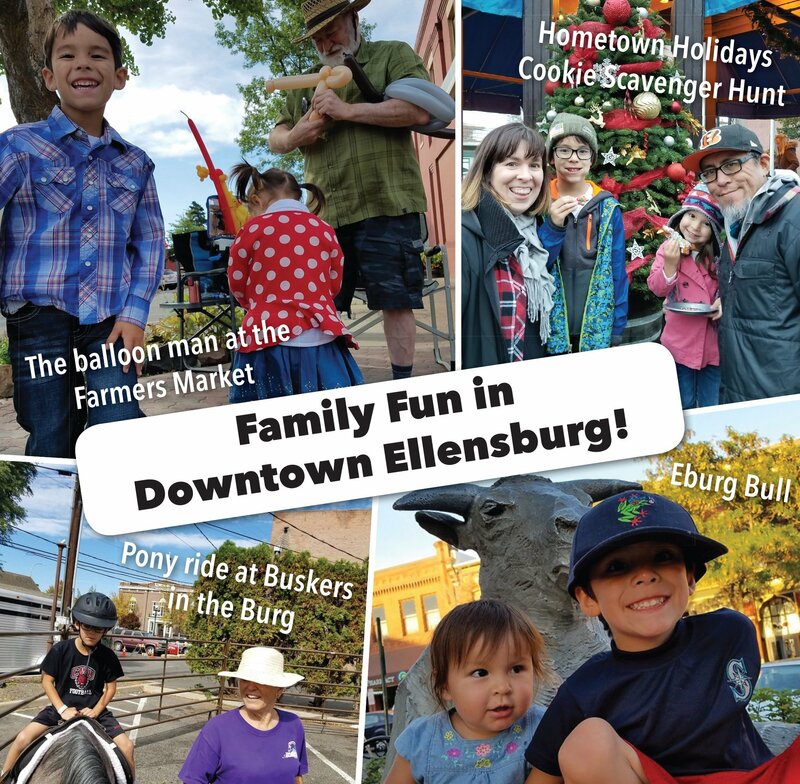 Through the Ellensburg Downtown Association and its collaboration with other organizations, they have created a vibrant downtown filled with family-friendly fun that creates lasting memories for all.